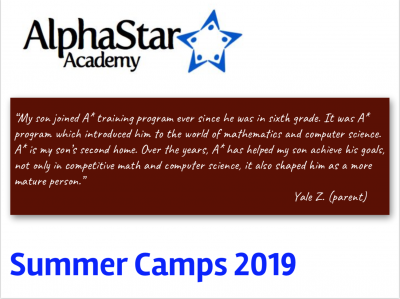 AlphaStar Summer Camps are unique opportunities for interested and talented students to improve their skills during winter/summer time where students are guided and trained by utilizing national and international competitions in a fun and challenging environment. In addition to intensive lectures and problem solving hours, the camp also consists of many educational, fun, and entertaining activities. I like how the teachers both teach the course clearly and take time to explain the problems. 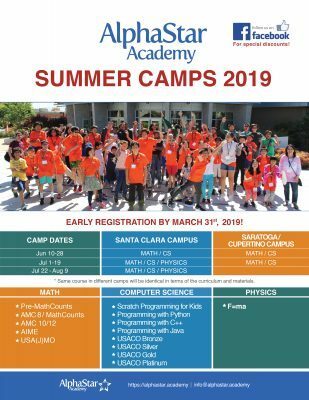 It was a really fun course and I learned a lot from it. The teachers gave a lot of new information that I have never learned before and was very useful to know. It was challenging but also fun. The course instructor was very knowledgeable and explained many of the concepts in an in-depth and illuminating way.